Research | ..:: CEReS ::..:: RFCS ::.. The assessment of environmental impacts of waste treatment processes, including the benefits of metals recovery and the valuation of management options (including the status quo), incorporating environmental externalities, on the specific case study developed within the project. The organisation of the CEReS project is shown <location; Work Package Figures>. The project responds to EC policies aimed at environmental protection and augmentation of the EU economy and technology base. Successful realisation of the CEReS project will develop a viable solution that delivers valuable material outputs through the co-processing of two environmentally damaging waste streams. WP1 will be used to obtain and characterise the raw materials required for development of the CEReS process as well as cross-mapping EU-wide occurrences of these wastes. The first part of this WP is focussed on the case study region (Poland). It will be used for the identification, characterisation and collection of the raw waste materials (acidogenic coal production wastes and shredded, low-grade PCBs from e-waste processing) to be used in the research and development of the CEReS flow-sheet. The second part of this WP looks at the distribution of raw materials at the European scale, specifically searching for areas in Europe where CEReS may be viable (i.e. geographical proximity of suitable coal mines and their wastes and e-waste/PCB collection and dismantling operations). Cross-mapping acidogenic coal production waste sources and deposits with e-waste collection and processing (dismantling) sites at the European scale, specifically searching for areas in Europe where CEReS may be viable (i.e. geographical proximity of suitable coal mines and their wastes and e-waste/PCB collection and dismantling operations). The shredded PCBs cannot be leached effectively as they are, due to issues with acid consumption and relatively low metal concentrations (due to entrainment within bulk glass fibre-polymer matrix). The primary objective of WP2 is to develop and optimise a mechanical pre-treatment combined with catalytic cracking and concentration step for the PCBs from WP1. COMET has already developed at semi-industrial scale this kind of pyrolytic approach for complex shredder residues (from end-of-life vehicles among others). This WP will allow the technological transfer of COMET’s catalytic cracking know how about organic shredder residues (OSR) to PCB processing. The unit operating parameters will be optimised for the production of value products (such as liquid fuels and halogens) and a solid metal rich char. This WP will produce a sufficient quantity of char for development of the downstream steps in WP3 and WP4. Development of primary (char) and secondary (heat, fuels, halogens) product management strategies. During WP3 the bioleaching process units will be developed: these will use the coal mine wastes from WP1 to produce the leaching solution (biolixiviant) and environmentally benign (stabilised) coal mine waste. The bioleaching will be further developed to optimise the biolixiviant in response to the operational needs of the char leaching system. A major element of the CEReS concept is the conversion of environmentally-damaging coal mine wastes into re-usable, stabilised material. Therefore, WP3 is further devoted to the development and testing of re-use options for the desulfurised coal waste (for example as granulated material for civil engineering or such for mine rehabilitation). Development of new directions of use for stabilised wastes. WP4 will demonstrate the feasibility for utilisation of the acidic leachates (biolixiviant) generated from coal wastes bioleaching (WP3) as a leaching agent for the extraction of base and high-value metals contained in the char originating from the pyrolysis of PCB’s (WP2). WP4 will also develop downstream processing options for valuable metal recovery from the leachate and solid residue of the char leaching system. Results will be fed back to WP2 and WP3 for further optimisation of the PCB pre-treatment and mine waste leaching steps as necessary. The testing and optimisation of the treatment options for the streams coming from the leaching steps (PLS, leached solid residues, raffinate) for maximising metals recovery and minimizing environmental impact. The research and technical development WPs will provide baseline data for the development of a process simulator (model) for the CEReS flow-sheet in WP5. WP5 will use the results of the experimental tests performed in WP 2, 3 and 4 to validate the model and to assess the technical and socio-economic feasibility of CEReS. 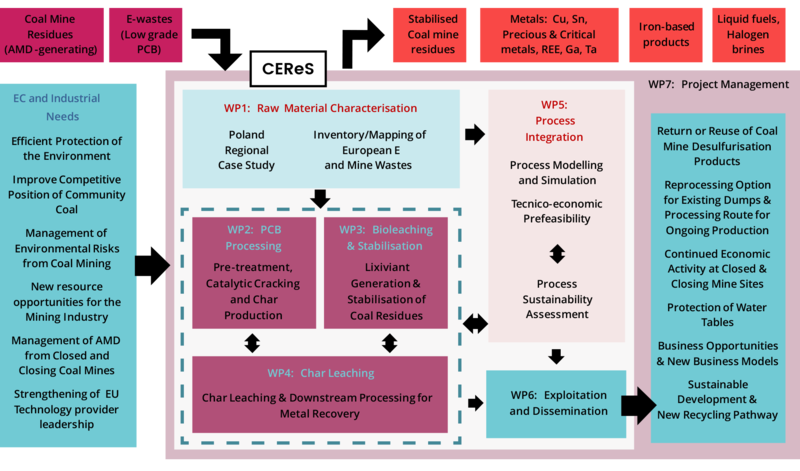 In depth analysis of CEReS process sustainability (from a technical, economic and environmental point of view) will be done, and potential for uptake at other EU locations assessed using cross-map data from WP1, determining the prefeasibility of such a processing concept. The overall objective of the work package, and finally of the whole project, is to check the validity of a new industrial ecology model applied to the mining and recycling industries and the methodology for developing its implementation on different European targets. The analysis will include a systemic approach and explore all the conditions (policy, regulation, environmental, etc.) that must be considered before any project development. To achieve this target, the results of work packages 1 to 4 will be compiled into a process simulator that will be used at several stages. It will allow the sensitivity analyses of the retained flow-sheet and possibly, alternative ones. Results will be used for technical performance estimation and also the economic and environmental assessments, determining the prefeasibility of such a processing concept. Dissemination activities in WP6 will make sure that the projects results are delivered to all appropriate audiences: academic and business groups, policy makers and the general public. Knowledge management will be ensured through the formation of an exploitation and IPR committee. Develop potential exploitation routes for project results.